How would you like to have an address plaque that exactly looks like the one in the picture or even better? You could possibly buy address signs and plaques that you would want to put in front of your humble abode. 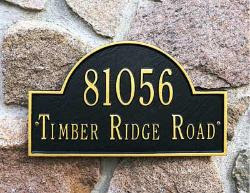 Check out MailBoxandbeyond.com for they have huge selections of address plaques that compliment the look of your house. They offer all kinds of mailboxes address plaques, personalized home and garden decor. They also offer a very large variety of Whitehall Products. So, don't look any farther, just click the link and buy the one you like. There are some houses that their house address plaques are hard to read or no where to be found because it was too small. Some houses have rusty address plaque that makes the visitor hard to locate the place because they can barely read the home address. So, make you house a home sweet home by upgrading the address plaque at you front door or yard. You can go online and browse around their large selection of mailboxes, address plaque and signs for a very reasonable price. You can pick the design, shape and color that you would like to buy. So, what are you waiting for? Check it out now! Ganda nga ng address plaque paano kung sa squatter ka naman sa atin nakatira, eh di wala din, lol!